Although Republicans lambasted Department of Energy (DOE) programs that support renewable energy with loans topping out at about $500,000, mums the word when the agency announced 6 times more for each of two new nuclear reactors. Last week, DOE gave the final approval for a $6.5 billion loan to build the first nuclear reactors in 30 years – by Southern Company in Georgia. Another conditional loan for $1.8 billion will likely be given to one of the partners, Municipal Electric Authority of Georgia. Calling it a "major milestone in the Obama administration’s commitment to jumpstart the US nuclear power industry," Secretary Moniz says the plants will be "first movers" for a new generation of advanced reactors that have advanced safety features. They can shut down automatically in an emergency. Two, 1100 megawatt Westinghouse AP1000® nuclear reactors are under construction adjacent to two existing nuclear plants. The project is expected to create 3,500 construction jobs, 800 permanent jobs, and once online, provide electricity to over a million households. Private capital isn’t interested in nuclear, it takes too long and is way too expensive – at an estimated $9 billion – especially in light of the risks from the disaster in Fukushima. While it can take a decade or more to build a nuclear plant, the same size solar project would be finished in 2-3 years at less than half the price. And over the past few years, with the advent of low natural gas prices, four nuclear plants have closed because they can’t compete on price. Even French utility EDF pulled out of nuclear in the US saying "We see no room for nuclear to expand in the US at this time," because of low natural gas prices. Instead, EDF is turning to solar and wind! That leads critics to wonder why the federal government would invest taxpayer dollars in such projects – where’s the GOP on this? They went so far as to threaten "contempt charges" in the case of Solyndra. And the reactors are already almost two years behind schedule and $1.6 billion over-budget, the same old story for the industry. Also as usual, utilities will pass the costs on to customers. While DOE touted the new plants as key to reducing US greenhouse gas emissions, the environmental community disagrees. "Nuclear power is not clean energy," Katherine Fuchs, an expert on nuclear subsidies with Friends of the Earth, told the Inter Press Service. "There is no way to deal with the waste, and we don’t yet have safe designs or adequate regulation. It’s entirely wrong to lump nuclear energy in with green energy, and it’s unbelievable that the administration would tout such a thing." 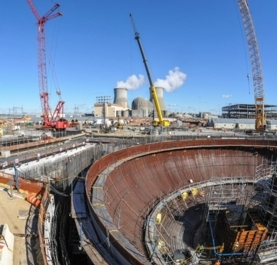 "We are disappointed that the Department of Energy wants to gamble billions of taxpayer dollars on dangerous and dirty nuclear power," says Anna Aurilio of Environment America. "When it comes to curbing global warming, time and money are of the essence and nuclear power fails on both counts." Even Fukushima announced plans to move completely to renewable energy. Last year, DOE re-started the controversial loan program because it still has $34 billion in unused funds. It is earmarking $1.5 billion for energy efficiency and renewable energy projects and about $20 billion for nuclear projects. Meanwhile, California is moving forward on how to replace the energy produced by the shuttered San Onofre Nuclear Generating Station. Utilities will be allowed to purchase 1,400 MW to replace the energy and of that, at least 575 MW must come from "preferred" resources – renewable energy, efficiency and energy storage. SDG&E would acquire at least 175 MW of preferred resources. Another 500 MW are open to all source bids – either natural gas or more preferred sources. "I was glad to see that there was no exclusive fossil fuel requirement here," Sierra Club Senior Attorney Matt Vespa told UT San Diego. They are allowing utilities to buy as much clean energy as they find feasible, "seriously looking at competition among all resources." I presume we will have the tea hadists weighing in their disapproval about this because it is bad for uncle sam to pick winners…right? shine 24 hours a day and it doesn’t shine where you should stick your heads. “There is no way to deal with the waste, and we don’t yet have safe designs or adequate regulation. This is true but because the technology isn’t available. It’s true because of politics and the incompetency of the Obama Admiknistration! This is not a govt. loan like Solyndra got. It is a loan guarantee, so that private loans and other non-federal sourced loans/bond etc. can be obtained at a lower interest rate than would occur without that support. The applicants had to pay several million up front in the DOE process, so if the utilizes do not default on the loans, the feds make money on the deal. If they default, then the taxpayers are on the hook for whatever is left after sales of assets. I’m very sure that Southern Company will complete Vogtle 3 & 4 and not default. The South Carolina site is not as far along, but I have a high degree of confidence in their success too. Nobody will be building large nuclear plants after those though, unless the economy really picks up and pushes electrical demand growth up a lot. That being said, I don’t like it when government gives favorable treatment to (or selectively punishes) one business or technology over others. Solar, wind, nuclear, hydro, geothermal, coal, oil, gas, tidal, and gerbils on wheels should all have to prove themselves on their engineering merits, true costs and benefits, and the ability to attract investment and pay their own way (including ROI). The taxpayer should not be footing the bill for subsidies or loan guarantees or the resulting costs of excessive regulations (rate payers eventually get stuck with that too).